The province of Zuid-Holland leads in charge activity of electric vehicles. Amsterdam, 9 May 2017 – The number of charging sessions of electric vehicles increased by 45 percent in 2016 compared to the year before. Zuid-Holland leads the way with the highest number of charging sessions, according to an analysis done by NewMotion, the European market leader, over the past five years among 13 million charge sessions in The Netherlands. The Randstad, comprised of the 4 largest Dutch cities, leads the way compared to the rest of the country; Zuid-Holland is followed by the provinces of Noord-Holland and Utrecht. Striking is the fact that also over a longer period of time, from 2010 until now, the leading provinces have experienced the highest charge activity in the country. “In 2013 you see growth percentages ranging from 500 to 900 percent compared to the total amount of charging sessions. Now the market is more developed, these percentages have normalized”. The amount of charging sessions in Noord-Holland and Zuid-Holland increased by 45 percent in 2016 compared to 2015. In Utrecht, an increase of 79 percent was experienced compared to 2015. Not only the amount of electric vehicles is growing, also the network of charging facilities is expanding at the same rate. “The number of electric vehicles on the road is increasing due to newer and better priced models as well as the growing extent of their use. This requires more charging points which will result in more growth in regions where relatively less charging sessions take place”, according to Zuidema. 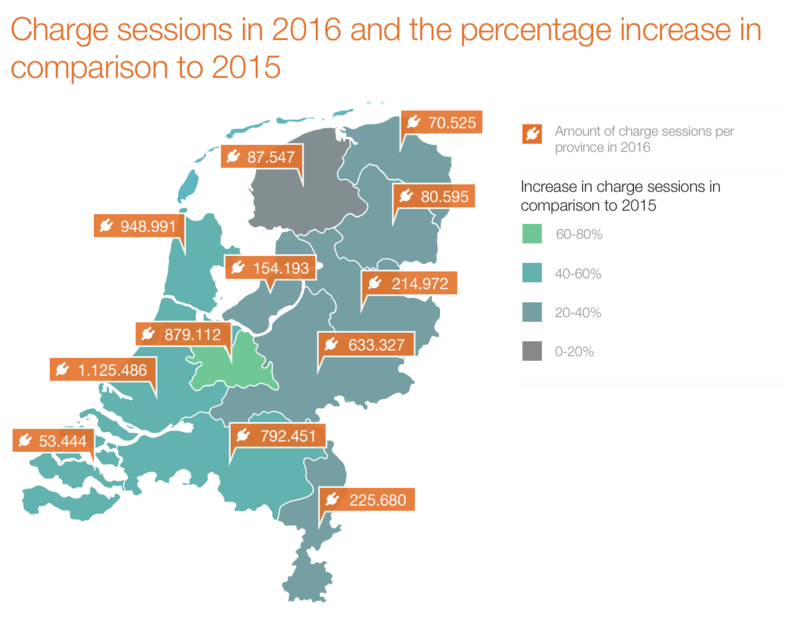 The lowest amount of charging sessions in 2016 took place in Zeeland, almost 19 times less than in Zuid-Holland. The number of charging sessions in Groningen and Drenthe, also low ranked, grew strongly by 23 and 25 percent respectively.